My study on political violence in rural Peru in the 1980s is now available on Amazon as a Kindle book. 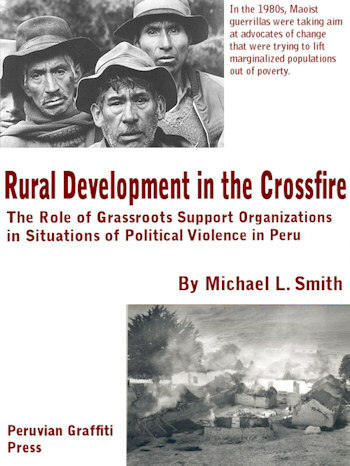 Rural Development in the Crossfire: The Role of Grassroots Support Organizations in Situations of Political Violence in Peru came out of my 12 year career as a journalist in Peru. 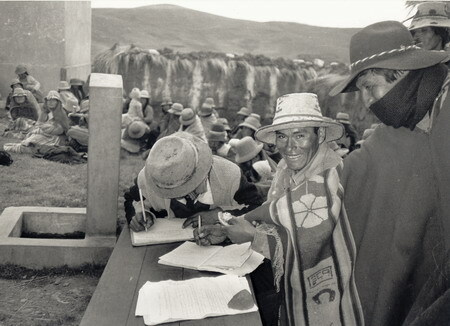 The book tells the story of political violence from the perspective of grassroots communities and the rural development organizations that were trying to lift them out of poverty in the Andes. The book is also the first from my new imprint: Peruvian Graffiti Press. In case you're wondering, the name of this site, g c i 275, is an acronym for the address of my residence when I lived in Lima, Peru—Genaro Castro Iglesias 275, Miraflores, Lima. It was the first home that I owned, where my kids grew up, my base of operations where I undertook some challenging endeavors, discovered computers and learned to write. The acronym represents where I came from and where I am right now and where I'm headed. In other words, coordinates in a unique topology, somewhere between Peru and the Web. The country inspires thoughts of exotic realms, contorted politics, and beguiling women, not to mention the standard fare of Machu Picchu, the Andes mountains and the Amazon rainforest. It defies easy labeling by outside observers and more than a few Peruvians. It is also where I lived and worked a large share of my adult life and where my wife, daughter and son were born. The landscape, the people, the politics, the culture shaped our beings, our dreams. For me, Peru is not just an interesting case study, but a defining experience. I bring together some of my writing about Peru and also point to some other Web material that make the country a little more comprehensible. I call this site Peruvian Graffiti because I never envisioned it as a formal portrait of the country and my understanding of it—rather, it's an impressionistic drawing made on a public canvas. I wrote a weekly political commentary and I always wanted to use that name for the column. Since I left Peru for the last time in 1996, Peru continued in upheaval, even after President Alberto Fujimori's resignation and the incoming government of Alejandro Toledo. My Peruvian politics resource includes the past of political violence, human rights abuses and Sendero Luminoso guerrillas. And in a stroke of "deja vu all over again," Alan Garica returned to the Casa de Pizarro. Now the Peruvians have elected the first "left wing" president, Ollanta Humala. On the bright side, it bucked a couple of lost decades of development and now has one of the strongest economies in the Americas. However, I have not visited in Peru since 2003, 10 years now, and I have lost my bearings in the maze of Peruvian politics and culture. That's why I have stopped commenting on my Peruvian blog, La Esquina del Movimiento. La Lista is my selection of Peruvian links, focusing on mainly English language sites. The War of the Fourth Sword: selected chapters from a book on political violence in Peru during the 1980s that I probably will never write. Translations of Peruvian poets: Antonio Cisneros, Mirko Lauer, Marco Martos, Blanca Varela, Javier Heraud, Abelardo Sanchez Leon, Julio Ortega, and others. Confessions of a Stringer: insights into the challenges of reporting on Peru and the people who helped me do it. You can also read my overview of the Peruvian media. My weblog: La Esquina del Movimiento used to provide updates and commentary on news about Peru and additions to the site. Unfortunately, I no longer have the time to maintain multiple blogs. Besides, my Peruvian experience is turning into history rather than current affairs. I will be redesigning this site over the coming months to recognize this change of focus. Throughtout this site, you will see the photographs of the Talleres de Fotografia Social (TAFOS) representing as a unique window into Peruvian society and culture. These black and white pictures were taken by grassroots photographers to tell their communities' stories and struggles. I had a chance to see their work and products first hand while I was working in Peru, and supported the dissemination of their message and photos. This experiment is no longer operating. Writing is the process that has defined me and how I relate to the world around me. News reporting, essays, poetry and translations were how I started out. Now it's concentrating on the web as the medium. See the writing section for other examples of my writing. For that matter, look throughout this site. Résumé : my life according to the rules of this formula. My Peruvian Life Story : a free-form approach to the curriculum vitae. I am in the process of starting a new publishing venture that will assist Peruvian literary magazine test the waters as an electronic publicaiton. I have another site Prana Journal — it's mainly a weblog about yoga, meditation, mindulness, spirituality and other matters of the heart/mind/body. It's all about residing in and fulfilling the potential of the moment. It's become my main writing outlet as I record my learning experience with yoga.